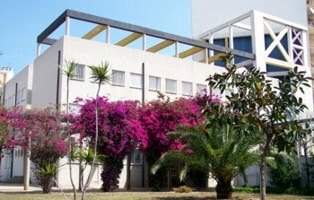 The Escuela Oficial de Idiomas (EOI) de Palma de Mallorca (Official School of Languages of Palma de Mallorca) is a state-run school in Palma de Mallorca, only teaching modern languages. It forms part of a large network of over 200 hundred official language schools distributed throughout Spain. It is the largest EOI in the Balearic Islands and one of the biggest EOIs in Spain. In April 2015 the EOI of Palma de Mallorca shows a student population of 9,686 official students who study 9 languages (Arabic, Catalan, Chinese, English, French, German, Italian, Russian and Spanish), distributed in seven buildings. In addition, there are 1554 external candidates taking our examinations in order to get a certificate as our institution is a recognised examination center in Spain; 711 students belong to the distance programme “That’s English”, 211 students of specific courses (for teachers, for foreign teacher assistants...) and about 1000 high school students participating in the “EOIES” programme (a collaboration programme between the EOI and high schools whereby high school students get an official accreditation of their language level). Students attending courses in the Escuela Oficial de Idiomas have different social backgrounds and their ages range from 14 to 70+.